In World War I, German and British bombers sometimes faced a few dozen light machine-guns defending a target. In World War II, Luftwaffe Stuka dive-bombers braved the combined fire of over 1,000 anti-aircraft guns to sink several capital ships at the Russian naval stronghold at Kronstadt in the Gulf of Finland. In World War I, hundreds of thousands of German troops fought months to gain ground measured in yards. In May 1940, eighty-five Luftwaffe Fallschirmjäger captured one of the world’s strongest fortifications at Fort Eben Emael, Belgium – manned by 1,200 defenders – in only eighteen hours. As a result of these and many other deeds of valor, some 1,785 Luftwaffe officers and enlisted men won the Knight’s Cross of the Iron Cross – World War II Germany’s highest decoration for bravery. This is their story through the eyes of their commanders of 113 of these men, as recorded in their official efficiency reports contained here. Of all the awards produced during World War II in Nazi Germany, none holds as much mystique as the Knight’s Cross of the Iron Cross. Many of the Luftwaffe Knight’s Cross winners, be they fighter pilots, Stuka pilots or German airborne troops, were not only excellent individual warriors, but later became elite unit commanders. To select the “best of the best” for these prestigious posts, the German military developed an efficiency report and promotion system whereby experienced commanders – often heroes in their own right – submitted confidential personnel reports on these men to the Luftwaffe High Command in Berlin. While many post-war authors have ventured their own opinions concerning the Luftwaffe‘s best, this work is the first of its kind to present what the Luftwaffe chain of command actually thought and wrote at that time. It was a system that required truthfulness, about the best the Luftwaffe had to offer – the men who shot down hundreds of enemy aircraft, destroyed dozens of trains and tanks on the ground, or soared from the skies under parachutes or in fragile gliders to seize Eben Emael and Crete. I hope that this work provides something for a wide variety of readers. 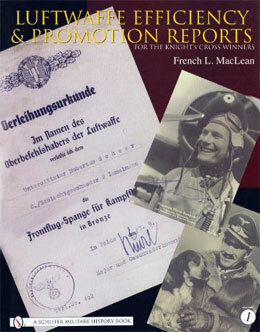 First, it is a window into the world of Luftwaffe efficiency reports and recommendations during World War II. Second, it is a collection of biographies of some of the most significant Luftwaffe leaders, pilots and paratroopers during the war. Last, it hopefully sheds some light – as well as some illustrations – on many of the numerous awards and decorations won by Luftwaffe soldiers during the conflict. That came with a price, however; the editor and I painfully found that to accommodate the massive number of illustrations for the efficiency reports in this work – while retaining a detailed historical narrative – it became imperative to produce a two-volume set. Part 1 of Volume 1 presents an overview of the German awards system and the efficiency report system. It describes when the reports were due, who was required to submit them, how the promotion/selection system used the reports and what was required in them. This section also describes the Luftwaffe rank system and a brief overview of Luftwaffe organizational structure of flying and airborne units. 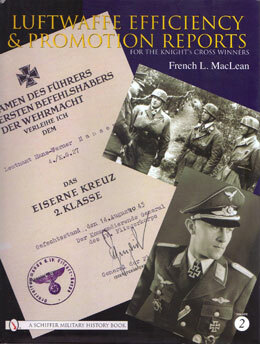 Part 2 of Volume 1 presents – in alphabetical order – some 53 Luftwaffe Knight’s Cross winners, whose efficiency reports and promotion recommendations appear in the book whose last names began with A through L. Each description contains a biography, as well as the most important piece – a translation of key pieces of the narrative of the report. Most of the biographies also show a photograph of the report and often a photograph of the individual. Part 3 of Volume 1 presents a shortened biography – also in alphabetical order – of each of the men who signed the reports, so the reader can put this information into context and assist autograph collectors in identification. Part 4 of Volume 1 is a glossary of German words and definitions associated with efficiency reports to assist historians and collectors, as well as a bibliography. Part 1 of Volume 2 begins with a continuation of the awards system, describing additional awards. Part 2 of Volume 2 contains 60 Luftwaffe Knight’s Cross winners, the contents of which parallel those in Volume 1. Part 3 of Volume 2 presents a shortened biography – also in alphabetical order – of each of the men who signed the reports contained in this volume. Part 4 of Volume 2 again presents a glossary of German words and definitions associated with efficiency reports and a bibliography, so the reader will not have to consult the first volume when looking for a definition. 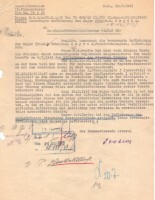 Luftwaffe Efficiency and Promotion Reports for the Knight’s Cross Winners (auf Englisch, 2 Bände, Alle zusammen 400 Fotografien, Band 1 – 262 Seiten; Band 2 – 259 Seiten.) Lebenslauf/Beurteilung für 113 Luftwaffe Ritterkreuzträger (Fallschirmjäger, Flugzeugführer, usw.) Band 1 – A-L; Band 2 – M-Z. Schiffer Verlag.